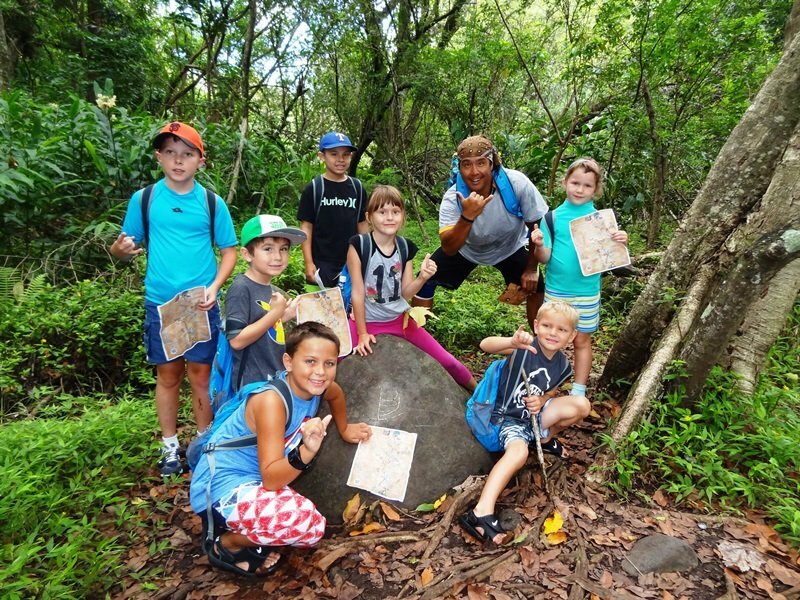 Home / Tours / Jungle Treasure Hunt Adventure – the Best for Your Kids on Maui! Maui is a paradise for nature lovers and adventure seekers alike – an ideal destination for families wanting to play together in the outdoors. We explore this friendly country through a multitude of activities: hiking in forests, swimming in the ocean (optional), and searching for a treasure. It is definitely the most unique and the best kids activity on Maui! Fun for the whole family! Make the most of your family time outdoors on our Jungle Treasure Hunt Adventure! Our tour starts in beautiful nature, in Maui green forests with the most amazing scenery. You and your children will have a fantastic time outdoors together! This is a real jungle adventure, so get ready to get wet and muddy. You will be hiking in the woods, cross the river, swimming in the ocean and fulfilling fun tasks while searching for a treasure. Your children will have a time of their lives. They will reveal the mystery of a lost treasure and will be the ones to find it. A great time for the whole family, guaranteed. No other activity like this anywhere else. Up to 3 hours of fun. CANCELLATION POLICY: Associated with cancellation fee (terms and conditions), rescheduling 48 hr for all reservations, and 72 hours for groups of 6 or more. If hazardous conditions occur due to bad weather, we reserve the right to switch the location of our Jungle Treasure Hunt to our Savanna Treasure Hunt without any entitlement for a refund. 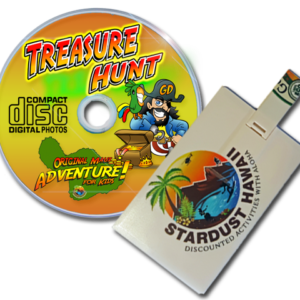 The Treasure Hunt will take place on the west side of Maui located in Lahaina. There will be no refunds or cancellations available. Shorts and short-sleeved shirts or t-shirts are best. If mosquitoes really bother you (your guide carries repellent), you could wear long pants and a long-sleeved shirt. Also, you’ll want to wear your swimsuit so you can swim in the waterfall pools (optional). 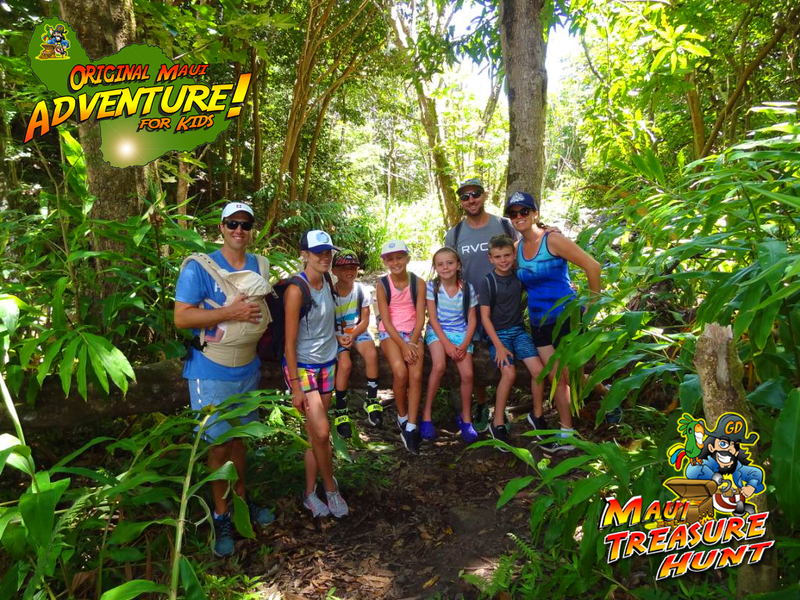 23 reviews for Jungle Treasure Hunt Adventure – the Best for Your Kids on Maui! Great hike–Mark was awesome, very knowledgeable about local flora/fauna, folklore, and fantastic with the kids. Highly recommend for families that want a more behind-the-scenes” look at Maui. My Grandson went on your tour with Mark and can’t stop talking about how much fun he had! Big Mahalo Mark from one Tour Guide to another! I will be recommending your Tour to my Guests! At the end of this hike, the parents of the two sets of kids on the hike all noted that nobody bickered and nobody complained on this hike–which, for those parents of kids reading this, is a good sign. Older kids might be a little bored by this hike, but there are multiple crossings of a stream, which can add a degree of difficulty that might engage them more. The guide on this hike was great with the kids, and knowledgeable about the flora (edible and otherwise) along the way, so kept the adults engaged as well. The hike wasn’t strenuous, but was pleasant, since it was mostly in the shade. Towards the end of the hike, we spent a pleasant snack time, the kids playing in a small lagoon, and the adults chatting. This is a good intro hike for younger kids (say 5-6 or so), and older kids might still enjoy it. As an adult, I appreciated the fact that the booking agent was prompt and efficient and pleasant to work with, and the guide was great with the kids. I’d highly recommend it (even though it’s a little weird to meet in a park and ride :-)). 4-year old would react. And I’m thrilled to say that he loved EVERY minute. Our guide was fantastic. As a father of two himself, he knew exactly how to speak to our son and engage him in the adventure. Every detail was perfectly planned — starting with he kids backpack, the kid friendly snacks and the treasure map, down to the tour guide who treated our 4-year old like he was the star of the day. I would highly recommend this company and this tour! My husband and I took this adventure with our two daughters (10 & 12) after hearing about the trip from a friend. Both girls had a great time and didn’t realize they were learning about nature and native folklore the entire time. My husband and I also learned some interesting facts and tips about Maui from Mark. The girls were excited about the treasure as well as the water and treats that were provided during a break. The hike was designed to go at our pace and it was a bit muddy. Mark did help us all cross the water safely as well. I was able to enjoy great activities with Stardust Hawaii. I felt they presented plenty of options that worked well around my busy schedule. All the information needed to prepare for my activities were clear and sent directly to my email along with a contact number to be called for any further questions. All my activities fit the description fully and were accompanied with fun/friendly staff. I’ve been a visitor on Maui 4 times and plan to continue to use Stardust Hawaii services in the future. ALOHA!!! A fun hike through some rainforest with an excellent guide (Mark), following clues on a “Pirate Treasure Map”. You’ll wade streams, get muddy and wet, and there’s an opportunity to swim in a forest pool. Wearing swim-gear and sneakers is fine: no need for any serious gear as the hike is relatively short. Our kids had a blast spotting the Pirate clues along the route, culminating in their eventual discovery of the treasure chest. Recommended. Brilliant hike along a fresh water stream – picturesque and serene . We were lucky enough to be the only ones on the hike. Just like every other reviewer has stated, our guide Mark was just excellent. Very knowledgeable and patient. The kids had a great time interacting with him. Bottom line, if you have kids 5-14 this is a MUST do in Maui. Beautiful hike and lots of fun! Our guide, Mark, was wonderful. He had ample patience with the kids, had fun activities, and good stories to share. The valley hike is absolutely gorgeous, lots of fun stuff to see and the river is invigorating! We even spotted a chameleon! It was just my daughter (age 5 years 10 months) and I. She hiked like a champ, no complaining or anything. She was excited about everything we saw, all the plants and critters, and especially the river swim! The snacks were more than enough for the time we were out. The only reason I didn’t give it 5 stars is the price. It’s a bit expensive for what we did. Our guide Mark was enthusiastic, knowledgeable, helpful and a lot of fun! We saw a lot, learned a lot, got a decent work out and our sons had an amazing time. Our entire party loved this and I would definitely recommend it – a great trip into the Iao Valley with gorgeous sites and a fun trail hike with lots of information plus a fun treasure hunt that engages the little ones. This hike has a few challenges so I would rate it higher than easy and you should plan for muddy shoes. The only real let-down for us was that the lagoon swim was not really a guaranteed feature of the hike and not very practical with children or older folks – as we were really looking forward to this and hikes in our swim suits and packed towels – is was unfortunate. The lagoon area is a small rock bordered deep area in the river which is fairly swift – but it’s on the opposite bank so you need to be capable of climbing/wading through to get to the deeper hole but it would not be safe for kids and we couldn’t leave ours on the opposite bank to take a dip. Overall though we really enjoyed this hike! We (the grandparents) scheduled a Maui Treasure Hunt for our 7 yr. old twin grand-daughters. Oh my goodness!…Mark (the official guide) led them and another family with a 6 yr. old and 4yr. old boys on the adventure of their lives. When we picked them up, they couldn’t stop talking about following the trail and clues, crossing a suspension bridge, seeing a huge bull frog and jumping into a stream. As I understand, Mark gave a natural history lesson of what they were seeing as they hiked along searching for the pirate treasure. When we got back to the condo, they emptied the bags and spread their “loot” on the floor for all to admire. The snacks in the backpacks they carried were more than enough to sustain them through the hike. We especially appreciated the photos Mark took along the trail and then sent to us…thank you so much for a fabulous ending to their vacation in Maui! Blend of nature and magic! Oh my goodness, our 6 and 4 year old boys LOVED this! My husband and I loved it as well! We got to go on a beautiful hike and the kids were so engaged! Mark was so warm and welcoming! It was truly one of the most fun days we have had on vacation!! 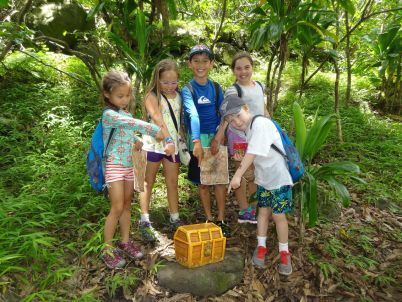 It’s a genius way to get kids to really enjoy nature and appreciate all the beauty of Maui! Highly recommended!! Great family fun! Our kids’ favorite activity on Maui! What a fun time! Booked this based on an ad we saw in an activities guide we picked up at the airport and didn’t regret it! Despite it saying “ages 5 and up,” we called ahead to book and were told we could take our (mature for her age) 3 yr old for free so made it a family activity thinking we could carry her if need be. Turns out she was well able to handle the hike with just a little help across the stream (carried her across on the way up, but made it across on the way back with just a little hand holding once her confidence had been built). The hike is relatively easy through a beautiful park and verdant valley, lush with vegetation, wild guava and banana trees, and with the opportunity to swim/wade in a beautiful cool stream along the way. It was easily accessible but uncrowded. In fact, we didn’t encounter any other hikers along the way. It felt like having our own little secret part of paradise to ourselves! The scenery was lovely and Mark, our guide, was knowlegeable and charismatic enough to entertain both the adults and kids alike. He was so patient with the kids and they had a great time looking for the clues and treasure. Each child had the chance to lead the group, and the hunt was a team approach, which encouraged the kids to work together. Along with our family, there was one 8 year old who came unaccompanied, and one other family with 2 young boys ages 4 and 6. Typically the tours are kept to small groups. After each clue was found, they all had to do “tasks”- things like imitating their favorite animals, standing on one foot while counting to 20, talking about what they wanted to be when they grew up and why. The final “treasure” included tattoos, plastic gold doubloons and some other goodies I won’t reveal here to save on the surprise factor. Suffice it to say the kids were so excited! Even our “free” 3 yr old was rewarded equally for her efforts, and great care was taken to include her in all the activities. Sufficient snacks and bottled water were provided in each hiker’s backpack for adults and kids, and bug spray was also available for those who wanted it. I would suggest a towel and that you wear a swimsuit under your clothing to enjoy the swim. Sneakers or hiking sandal This was our kids’ favorite activity of our trip to Maui. It was a great introduction to hiking for them and something we could all enjoy together. Took my daughter and 2 nieces on the treasure hunt. The girls had a great time and are still talking about the scenery and legends they learned. The guides are very knowledgable and fabulous with the kids. I will recommend this tour to anyone with elementary school children who visits the island. The tour covers everything from snacks to bug spray. Just grab a towel and a bathing suit and go have an experience that won’t soon be forgotten. We took our 5 year old niece on this tour. It was a wonderful time. The tour guide was great with the kids. Let each one have a chance to be a leader. I would recommend this tour to anyone. What a great experience. Did it with kids 5 and 8 they were entertained every minute. The guide was Wonderful with the kids and informative for the adults. The kids follow a treasure map and follow it to find the treasure. A must do with kids. Not knowing what to expect, we still wanted to give it a try. Our kids are 8, 12 and 14 years old. We signed them up for the morning tour, without us parents participating. We went shopping and grabbed lunch while waiting for them in Kahului city. It was a nice relaxing time for us – parents. Three hours later we picked them up at the meeting spot. Our kids were full of new experiences, they kept telling us stories from the event and were super excited about the whole Treasure Hunt. They got to swim, and found a treasure besides other activities. The price was good for the length of the tour and also we got a great discount on the second and third child. It was definitely a good deal and great experience for our kids and parents as well.